It still irritates me that the Xbox One isn't backwards-compatible. From Red Dead to GTA V, there are old games I still own and still want to play, but because I don't have an Xbox 360 anymore (one died and I traded the other in for the XB1), they just...sit there. It'd be OK if Xbox, as a brand, had never done such a thing, but to do it with the Xbox 360 (which played most Xbox games) then take it away again on Xbox One, ungh. Ed Zarcik has a solution, though. He literally put both consoles in the same box. Easy. 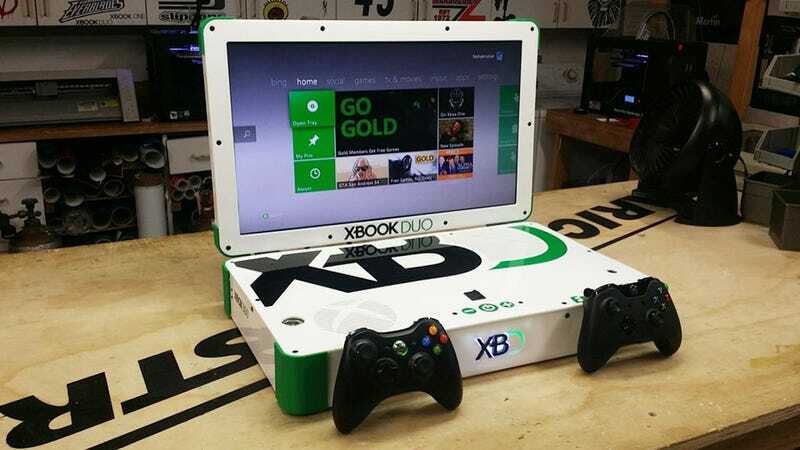 The Xbox Duo is a laptop that carries the guts of both consoles, along with two separate disc trays, meaning you can enjoy the best of both consoles. To save space they both share the same power source (the Xbox One's), and there's a 22" monitor attached so you can take it anywhere. He takes commissions, so if you want to get hold of one, you can get in touch with Ed on his website.